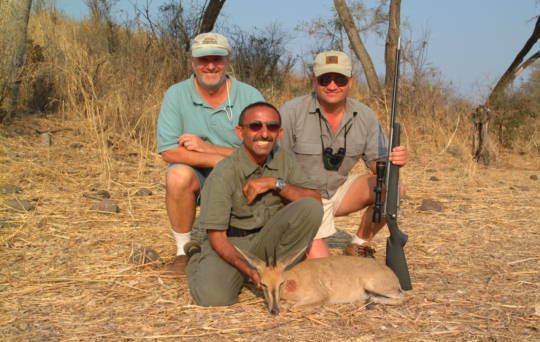 As usual this time of the year, we always look forward to going and hunt with our friends the Vincents. 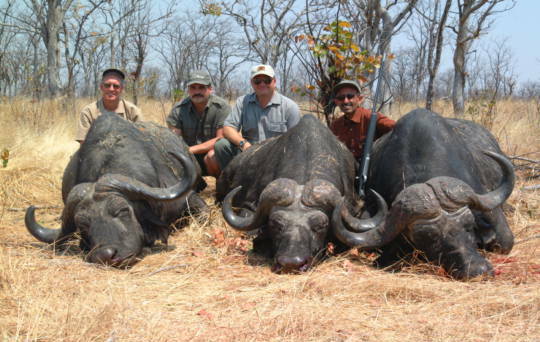 Here is a small selection of what we hunted. This is our camp. 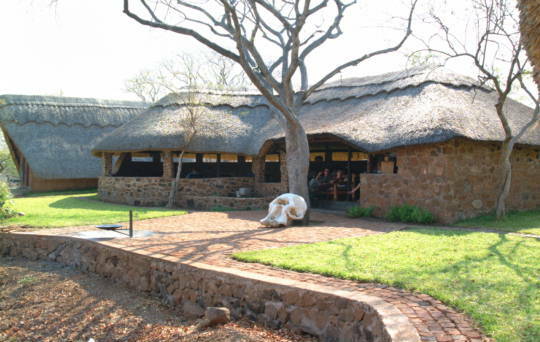 It over looks a valley where we see buffalo, kudu, waterbuck, impala, warthogs and baboons almost on a daily basis. 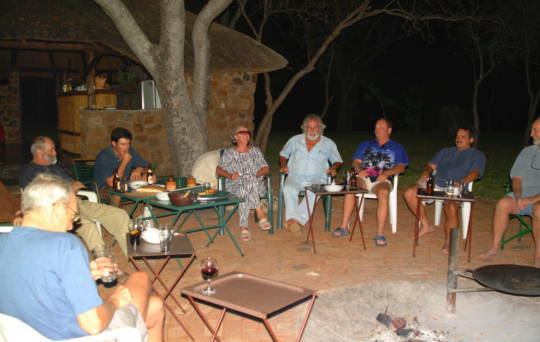 The lions also visited us almost every night in the camp, as well as hyenas. One day we found the tracks of a white rhino next to the camp too. This is a view from our camp. I was standing by the BBQ when I took it. The green trees to the top left are about 800-1000 yards. 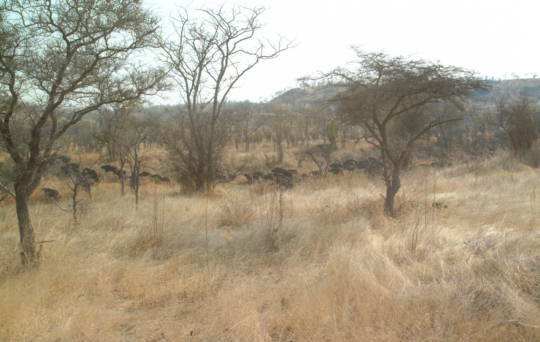 We saw two warthogs take off from the grass not far from us. We ran after them, and managed to bag this one. Apparently, these 3 bulls have been making their home in some high grass, and tend to run away as soon as anyone gets close. They did just that when we drove close by, and as the meat racks were empty, we decided to follow them, and see if we can get a shot at them. We finally caught up with them about 2 hours later. Luckily, they were in relatively clear area, and we managed to get all three. 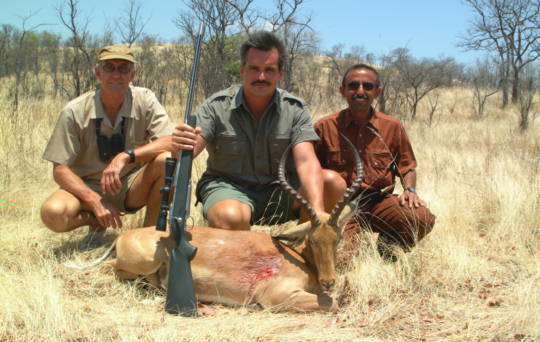 Walter gave us an order to shoot a duiker in the neck, as he wanted to BBQ it, and did not want any meat damage. 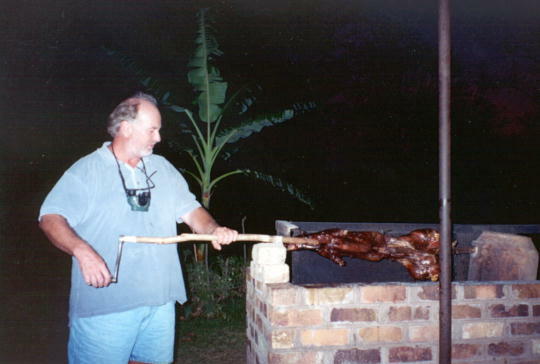 The above mentioned duiker being roasted to perfection by our Master Chef, Walter. He is not trying to look comical on purpose, this is the way he is. 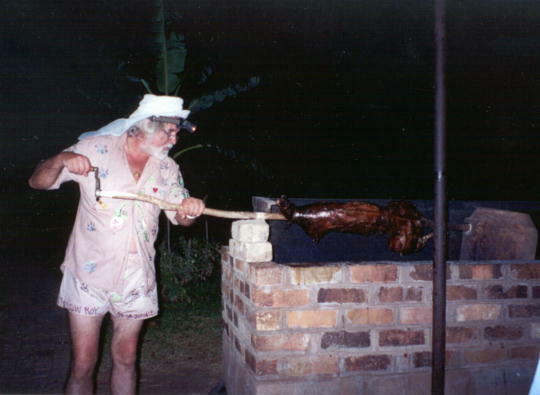 Dwight is trying his hands at turning the spit. I think this is all the work he did on safari. 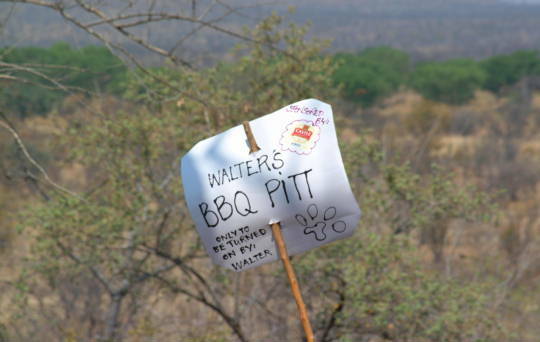 Walter put this sign up, just to make sure no one messes up his coking. 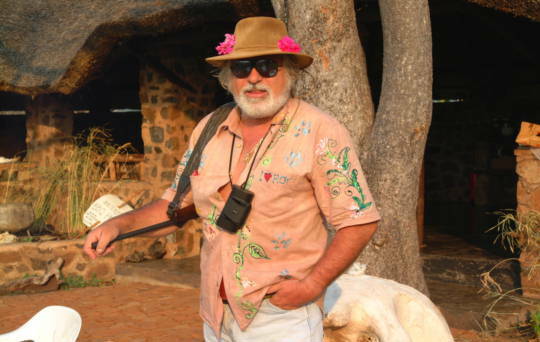 A fully dressed African Hunter. I wish I could have understood what the trackers were saying. 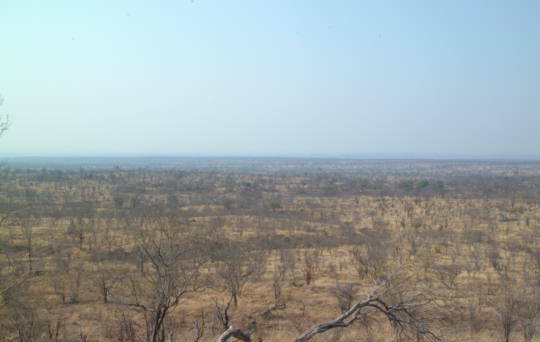 We saw this sable quite a long way away on top of a hill, and gave chase. We found him feeding in some long grass, and only the top of his horns were visible. 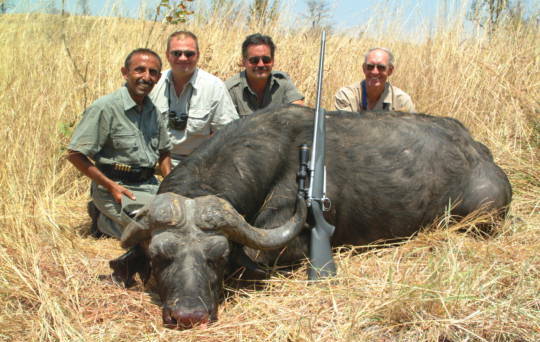 We waited until he decided to move, and shot him. You can see the exit of the bullet on his shoulder. 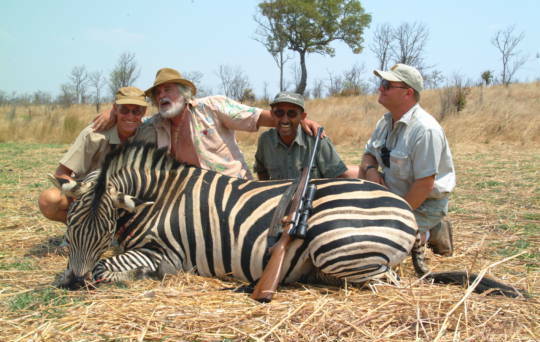 Walter has always wanted to shoot a zebra, and the closest he has ever got was shoot a zebra blanket! 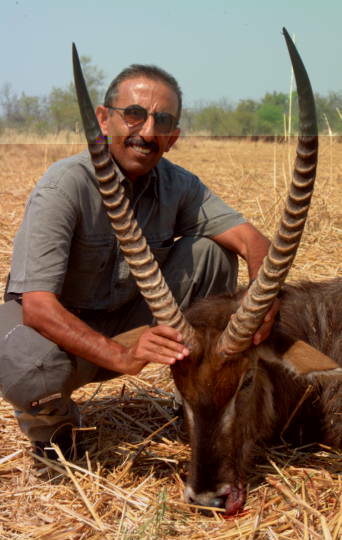 Well, this year he performed as a well seasoned safari hunter, and managed to get a real zebra rug for his wife. 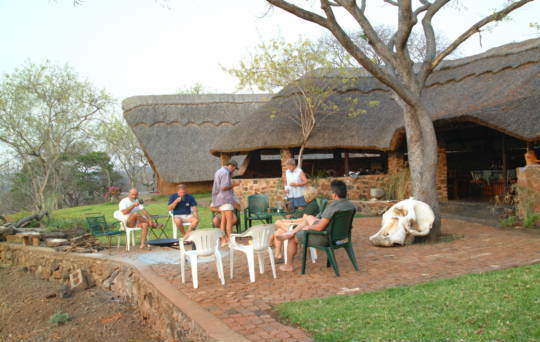 We normally leave camp early, but this morning we went out at 4.30 to a lions blind. The lionesses were there, but the big male we were after has already fed and gone. We came back to camp for breakfast. 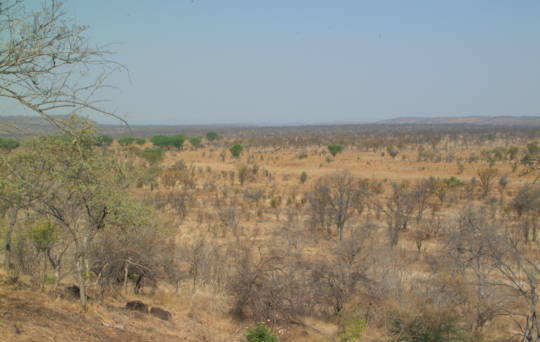 This is a view of some of the country side we hunted. A herd of buffalo that did not like the looks of us. Walter was shouting "Tell him to SLOW DOWN!" 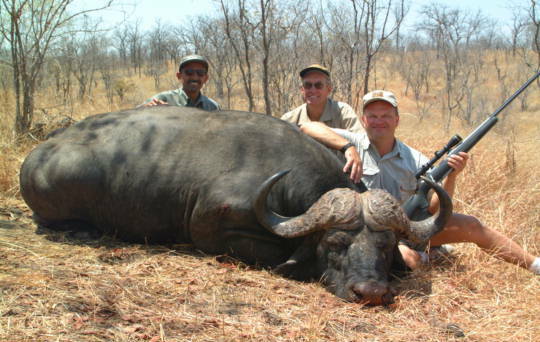 You can see the big smile on Todd's face, after bagging this buffalo. 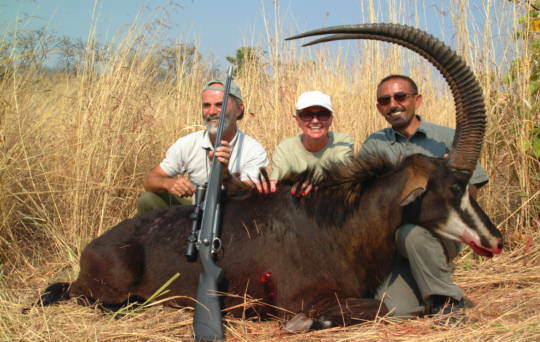 He hunted for three days before he managed to get a shot at this bull. 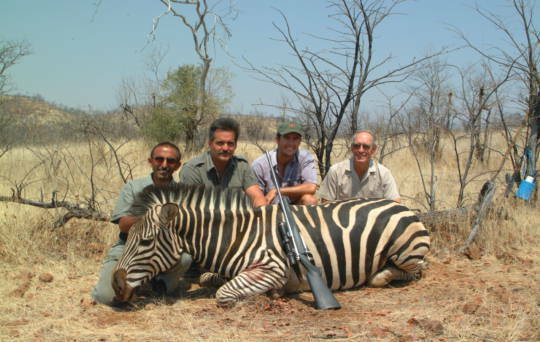 Lions love zebra, so we thought of trying to get one to our bait by shooting him a zebra. We saw this stallion and a few others running into the bush, I jumped out of the truck and shot him. 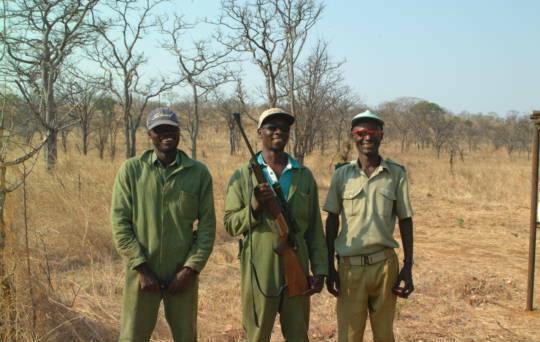 The lions ate him, but we never managed to get the big male we were after. We saw this waterbuck with a few of his friends feeding in this grassy area. We stalked them to about 100 yards. Another try at the OUTER CIRCLE! We followed a few bulls for about an hour, and we saw this one lying down in the grass. All we could see was part of his head, so there was no way to shoot him. We were trying to get to higher ground to see better, and came across all his friends. I shot one of them as he was lying down. They all took off. We then saw this one looking back at us. I gave him a shot into his chest. He ran a few yards and stopped. Another shot put him down. We found the other one lying in the grass too. This is our WAKE UP alarm in the morning! 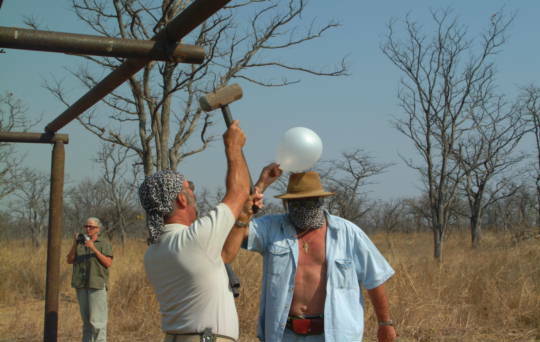 Horst whacks the balloon on Walter's head, and Walter screams his head off! 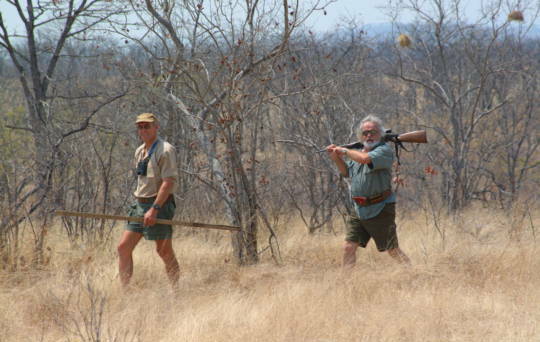 As we usually do, we had a shooting contest between our trackers and the game scout. It is all for fun, as all three get the same prize - a good folding knife and a pair of glasses. This year Phineas, the one in the middle won the contest. 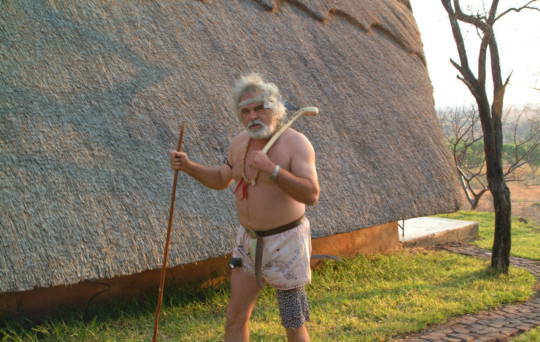 This is Chief Bola Bola, of the Walterhog Tribe. He had all of us in fits of laughter. 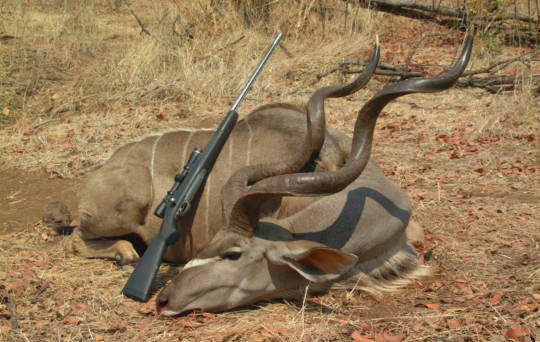 We saw this kudu disappear into a valley with a few cows and one young bull. We got to the top of a hill over looking them. We could see 2 of the cows and the young bull, but not this one. We waited for a while, and he appeared. 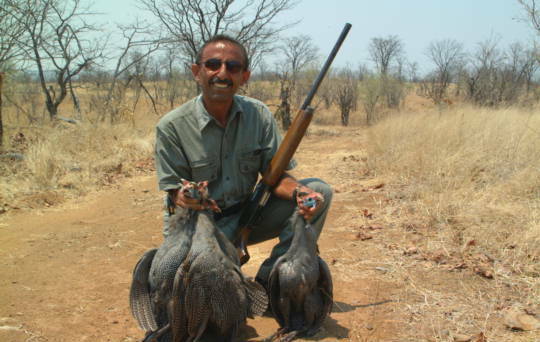 I shot a few guinea fowl for the pot. They make a delicious stew. By the fire waiting for dinner. 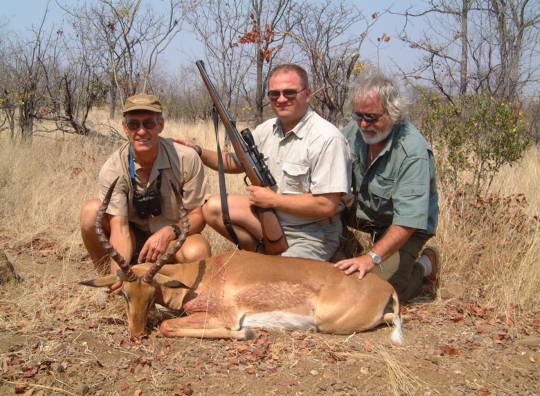 We wanted an impala for leopard bait, so my friend Hite obliged by shooting this one. 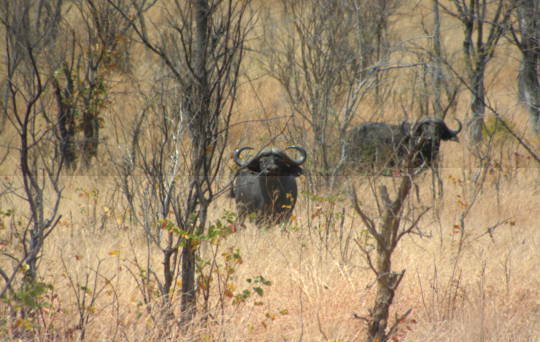 A couple of buffalo bulls wondering what the hell we were doing so close to them. 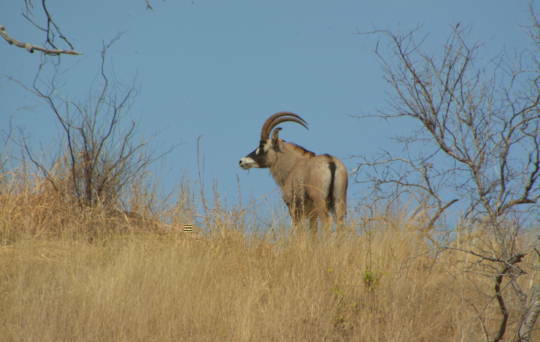 We saw this roan and a few others run up the hill side. He stopped at the top for us to take this photo. This time it was Todd's turn to shoot the bait. We had to laugh at this. Dwight was on a diet while on safari, and as soon as we got to Johannesburg airport, he made a bee line to the ice cream parlor! 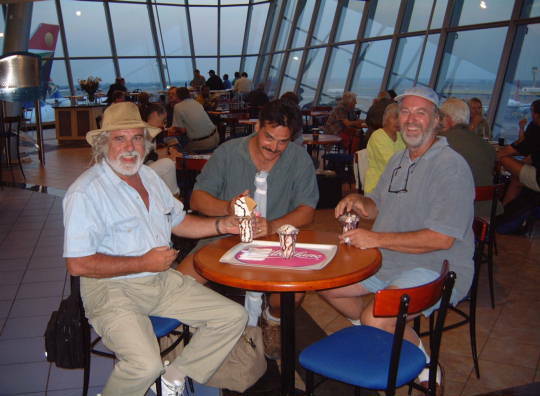 Walter, Hite and myself did not want him to feel lonely, so we joined him - as long as he paid the bill. A great time was had by us all.